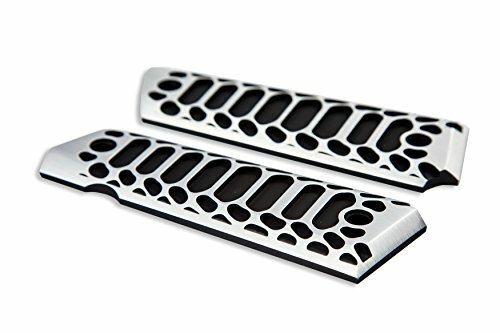 BRAND NEW Original Design Grips for 1911/1911 Clones Exclusive Design "Cobra Skeleton" Only available through Valkyrie Dynamics Brushed finish CNC Billet aluminum Ambidextrous Grips for 1911's and 1911 Clones These grips DO NOT feature the recessed cut on the back of the right side grip.This cut is now optional. Send seller a message with your order number requesting to add the ambi cut.To determine if you need this cut, just check your current grips.100% American Made Exclusive Design only available through Valkyrie Dynamics MADE IN USA Seller's other than Valkyrie Dynamics attempting to sell copies of our designs will be pursued legally and held financially responsible for back damages, repayment of legal fees and profit loss. 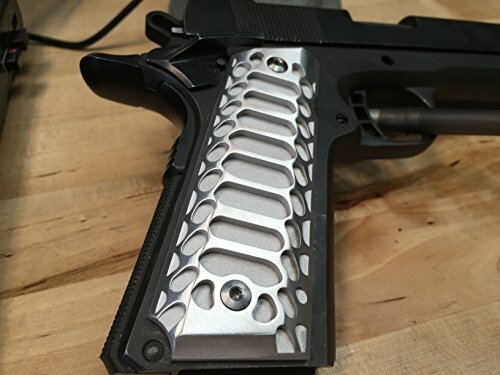 BRAND NEW Original Design Grips for 1911/1911 Clones Exclusive Design "Cobra" Only available through Valkyrie Dynamics BRUSHED SURFACE/BLACK CORE CNC Billet aluminum Ambidextrous Grips for 1911's and 1911 Clones These grips DO NOT feature the recessed cut on the back of the right side grip.This cut is now optional. Send seller a message with your order number requesting to add the ambi cut.To determine if you need this cut, just check your current grips.100% American Made Exclusive Design only available through Valkyrie Dynamics MADE IN USA Seller's other than Valkyrie Dynamics attempting to sell copies of our designs will be pursued legally and held financially responsible for back damages, repayment of legal fees and profit loss. 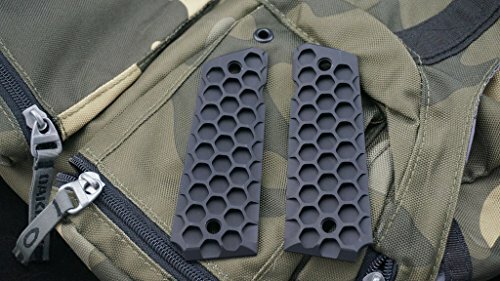 1911 Government/Commander Full Size Grips Aluminum Matte Black "Cobra"
BRAND NEW Original Design Grips for 1911/1911 Clones Exclusive Design "Cobra" Only available through Valkyrie Dynamics Matte Black CNC Billet aluminum Ambidextrous Grips for 1911's and 1911 Clones These grips DO NOT feature the recessed cut on the back of the right side grip.This cut is now optional. Send seller a message with your order number requesting to add the ambi cut.To determine if you need this cut, just check your current grips.100% American Made Exclusive Design only available through Valkyrie Dynamics MADE IN USA Seller's other than Valkyrie Dynamics attempting to sell copies of our designs will be pursued legally and held financially responsible for back damages, repayment of legal fees and profit loss. 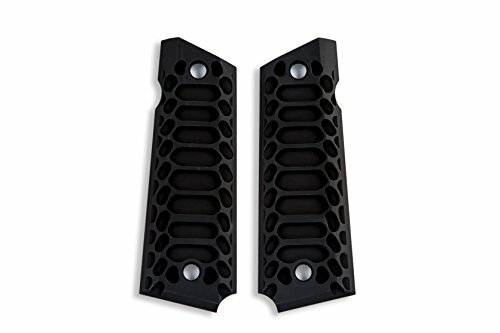 1911 Government/Commander Full Size Grips Aluminum Matte Black "Cobra Skeleton"
BRAND NEW Original Design Grips for 1911/1911 Clones Exclusive Design "Cobra Skeleton" Only available through Valkyrie Dynamics Black (Type III Hard Anodizing) CNC Billet aluminum Ambidextrous Grips for 1911's and 1911 Clones These grips DO NOT feature the recessed cut on the back of the right side grip.This cut is now optional, Send seller a message with your order number requesting to add the ambi cut.To determine if you need this cut, just check your current grips. 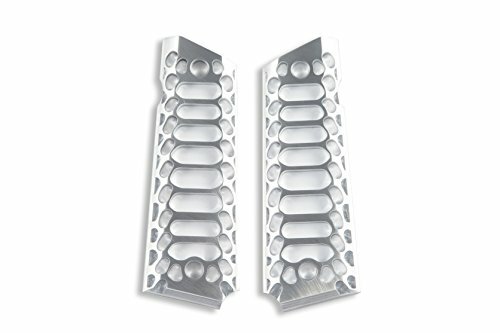 Seller's other than Valkyrie Dynamics attempting to sell copies of our designs will be pursued legally and held financially responsible for back damages, repayment of legal fees and profit loss. 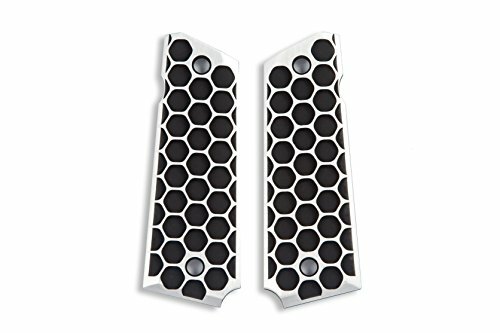 BRAND NEW Original Design Grips for 1911/1911 Clones Exclusive Design "The Hive" Only available through Valkyrie Dynamics Duo Finish (Brushed Surface/Black Core) CNC Billet aluminum Ambidextrous Grips for 1911's and 1911 Clones These grips DO NOT feature the recessed cut on the back of the right side grip.This cut is now optional. Send seller a message with your order number requesting to add the ambi cut.To determine if you need this cut, just check your current grips.100% American Made Exclusive Design only available through Valkyrie Dynamics MADE IN USA Seller's other than Valkyrie Dynamics attempting to sell copies of our designs will be pursued legally and held financially responsible for back damages, repayment of legal fees and profit loss. 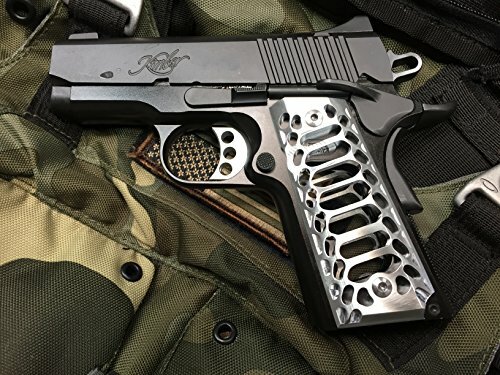 BRAND NEW Original Design Grips for 1911/1911 Clones Exclusive Design "Cobra Skeleton" Only available through Valkyrie Dynamics Skeleton BRUSHED SURFACE CNC Billet aluminum Ambidextrous Grips for 1911's and 1911 Clones Compact/officerThese grips DO NOT feature the recessed cut on the back of the right side grip.This cut is now optional. Send seller a message with your order number requesting to add the ambi cut.To determine if you need this cut, just check your current grips.100% American Made Exclusive Design only available through Valkyrie Dynamics MADE IN USA Seller's other than Valkyrie Dynamics attempting to sell copies of our designs will be pursued legally and held financially responsible for back damages, repayment of legal fees and profit loss. 1911 Government/Commander Full Size Grips Aluminum DUO FINISH "Cobra"
BRAND NEW Original Design Grips for 1911/1911 Clones Exclusive Design "Cobra" Only available through Valkyrie Dynamics BRUSHED SURFACE/Satin Core CNC Billet aluminum Ambidextrous Grips for 1911's and 1911 Clones These grips DO NOT feature the recessed cut on the back of the right side grip.This cut is now optional. Send seller a message with your order number requesting to add the ambi cut.To determine if you need this cut, just check your current grips.100% American Made Exclusive Design only available through Valkyrie Dynamics MADE IN USA Seller's other than Valkyrie Dynamics attempting to sell copies of our designs will be pursued legally and held financially responsible for back damages, repayment of legal fees and profit loss. 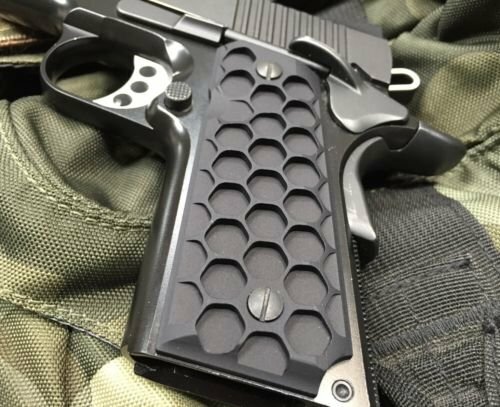 BRAND NEW Original Design Grips for 1911/1911 Clones Exclusive Design "Hive" Only available through Valkyrie Dynamics Black (Type III Hard Anodizing) CNC Billet aluminum Ambidextrous Grips for 1911's and 1911 Clones Compact/officerThese grips DO NOT feature the recessed cut on the back of the right side grip.This cut is now optional. Send seller a message with your order number requesting to add the ambi cut.To determine if you need this cut, just check your current grips.100% American Made Exclusive Design only available through Valkyrie Dynamics MADE IN USA Seller's other than Valkyrie Dynamics attempting to sell copies of our designs will be pursued legally and held financially responsible for back damages, repayment of legal fees and profit loss. 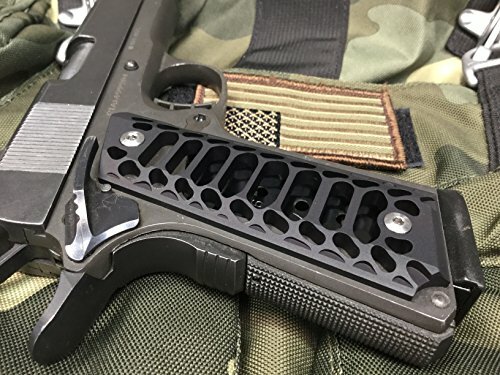 1911 Government/Commander Full Size Grips Aluminum BLACK FINISH "The Hive"
BRAND NEW Original Design Grips for 1911/1911 Clones Exclusive Design "The Hive" Only available through Valkyrie Dynamics Black (Type III Hard Anodizing) CNC Billet aluminum Ambidextrous Grips for 1911's and 1911 Clones These grips DO NOT feature the recessed cut on the back of the right side grip.This cut is now optional. Send seller a message with your order number requesting to add the ambi cut.To determine if you need this cut, just check your current grips.100% American Made Exclusive Design only available through Valkyrie Dynamics MADE IN USA Seller's other than Valkyrie Dynamics attempting to sell copies of our designs will be pursued legally and held financially responsible for back damages, repayment of legal fees and profit loss. 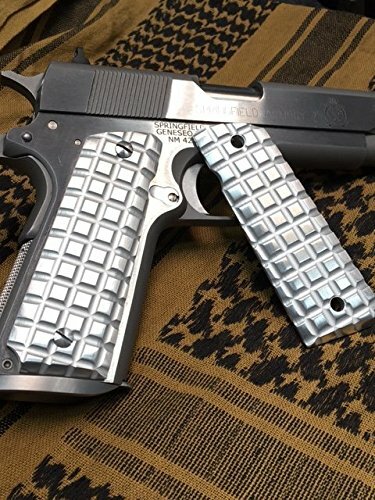 1911 Government/Commander Full Size Grips Aluminum "Grenade Pattern"
BRAND NEW Original Design Grips for 1911/1911 Clones Exclusive Design "Grenade" Only available through Valkyrie Dynamics Brushed CNC Billet aluminum Ambidextrous Grips for 1911's and 1911 Clones These grips DO NOT feature the recessed cut on the back of the right side grip.This cut is now optional. Send seller a message with your order number requesting to add the ambi cut.To determine if you need this cut, just check your current grips.100% American Made Exclusive Design only available through Valkyrie Dynamics MADE IN USA Seller's other than Valkyrie Dynamics attempting to sell copies of our designs will be pursued legally and held financially responsible for back damages, repayment of legal fees and profit loss.